Perhaps your journey of faith in God has been more than one or two years, and perhaps in your life over these years you have endured much hardship; or perhaps you have not been subjected to hardship and instead have received much grace. It may also be that you have experienced neither hardship nor grace, but instead have lived a life most ordinary. Regardless, you are still a follower of God, so let us fellowship about the subject of following Him. However, I must remind all who read these words that the word of God is directed toward all those who acknowledge God and all those who follow God, not toward all people at large, including those that do not acknowledge God. If you believe that God is speaking to the multitude, to all people in the world, then the word of God will have no effect upon you. So, you should keep all the words close to your heart, and do not place yourself outside the scope of them. In any case, let us speak of what is happening in our house. You should all now understand the true meaning of believing in God. The meaning of faith in God that I previously spoke about is related to your positive entry. This is not so today. Today I would like to analyze the essence of your faith in God. Of course, this is guiding you from the negative aspect; if I do not do so, then you will never know your true countenance and will forever boast of your devoutness and faithfulness. In other words, if I do not unearth the ugliness deep within your hearts, then each of you will place a crown upon your head and give all glory to yourself. Your haughty and arrogant nature drives you to betray your own conscience, to rebel against and resist Christ, and to reveal your ugliness, thereby exposing to the light your intentions, notions, excessive desires, and eyes full of greed. And yet you continue to profess that you will dedicate your life to the work of Christ, and you repeat again and again the truths that were spoken by Christ long ago. This is your “faith.” This is your “faith without impurity.” I have held man to a very strict standard all along. If your loyalty comes with intentions and conditions, then I would rather not have any of your so-called loyalty, for I abhor those who deceive Me through their intentions and extort Me with conditions. I only wish for man to be loyal to none other than Me, and to do all things for the sake of and to prove that one word: faith. I despise your use of sweetened words to make Me rejoice. For I always treat you with complete sincerity and so I wish for you to also act toward Me with a true faith. When it comes to faith, many may think that they follow God because they have faith, otherwise they would not bear such suffering. Then I ask you this: Why is it that you never revere God though you believe in His existence? Why, then, do you have no fear of God in your heart if you believe in His existence? You accept that Christ is the incarnation of God, so why do you hold such contempt toward Him? Why do you act so irreverently toward Him? Why do you openly judge Him? Why do you always watch His movements? Why do you not submit to His arrangements? Why do you not act in accordance with His word? Why do you extort and rob Him of His offerings? Why do you speak in the place of Christ? Why do you judge whether or not His work and His word are correct? Why do you dare blaspheme Him behind His back? Are these and others what constitute your faith? Every part of your speech and behavior reveals the elements of unbelief in Christ that you carry within. Your motives and goals for what you do are pervaded by unbelief; even that sense emanating from the look in your eyes is tainted with such elements. In other words, each of you, during every minute of the day, carry with you elements of unbelief. This means that, at every moment, you are in danger of betraying Christ, for the blood that runs through your body is infused with unbelief in the incarnate God. Therefore, I say that the footprints you leave upon the path of belief in God are not substantial. Your journey along the path of belief in God is not well grounded, and you are instead simply going through the motions. You are always skeptical of the word of Christ and cannot immediately put it into practice. This is the reason that you do not have faith in Christ, and always having notions about Him is another reason that you do not believe in Christ. Always retaining skepticism about the work of Christ, letting the word of Christ fall on deaf ears, having an opinion on whatever work is done by Christ and not being able to properly understand it, having difficulty putting down notions no matter the explanation you receive, and so on; these are all elements of unbelief mixed in your hearts. Though you follow the work of Christ and never fall behind, there is too much rebellion mixed in your hearts. This rebellion is an impurity in your belief in God. Perhaps you do not agree, but if you cannot recognize your own intentions from it, then you shall surely be one who will perish. For God perfects only those who truly believe in Him, not those who are skeptical of Him, and least of all those who follow Him despite never having believed that He is God. Some people do not rejoice in the truth, much less judgment. Rather, they rejoice in power and riches; such people are deemed to be snobs. They exclusively seek out those denominations in the world with influence and those pastors and teachers coming from seminaries. Despite having accepted the way of truth, they remain skeptical and are unable to devote themselves fully. They speak of sacrificing for God, but their eyes are focused on the great pastors and teachers, and Christ is brushed aside. Their hearts are filled with fame, fortune, and glory. They do not believe at all that such a meager man is capable of conquering so many, that one so unremarkable is capable of perfecting people. They do not believe at all that these nobodies among the dust and dunghills are the people chosen by God. They believe that if such people were the objects of God’s salvation, then heaven and earth would be turned upside down and all men would laugh their heads off. They believe that if God chose such nobodies to be perfected, then those great men would become God Himself. Their perspectives are tainted with unbelief; indeed, far from unbelief, they are preposterous beasts. For they only value position, prestige, and power; what they hold in high regard are large groups and denominations. They have no regard at all for those led by Christ; they are simply traitors who have turned their backs on Christ, on truth, and on life. What you admire is not the humility of Christ, but those false shepherds of prominent standing. You do not love the loveliness or wisdom of Christ, but those wantons who associate with the vile world. You laugh at the pain of Christ who has no place to lay His head, but admire those corpses that seize offerings and live in debauchery. You are not willing to suffer alongside Christ, but gladly go into the arms of those reckless antichrists though they supply to you only flesh, only letters, and only control. Even now your heart still turns toward them, toward their reputation, toward their status, and toward their influence. And yet you continue to hold an attitude of resisting and refusing to accept the work of Christ. This is why I say that you do not have the faith of acknowledging Christ. The reason you have followed Him to this day is entirely because you were forced. In your heart forever tower many lofty images; you cannot forget their every word and deed, nor their influential words and hands. They are, in your heart, forever supreme and forever heroes. But this is not so for the Christ of today. He is forever insignificant in your heart and forever undeserving of reverence. For He is far too ordinary, has far too little influence, and is far from lofty. In any case, I say that all those who do not esteem the truth are all unbelievers and traitors of the truth. Such men shall never receive the approval of Christ. Have you now identified how much unbelief is within you? And how much betrayal of Christ? I exhort you thusly: Since you have chosen the way of truth, then you should devote yourself wholeheartedly; do not be ambivalent or half-hearted. You should understand that God does not belong to the world or any one person, but to all those who truly believe in Him, all those who worship Him, and all those who are devoted and faithful to Him. Presently, there is still much unbelief within you. Try looking diligently within yourselves and you will surely find your answer. 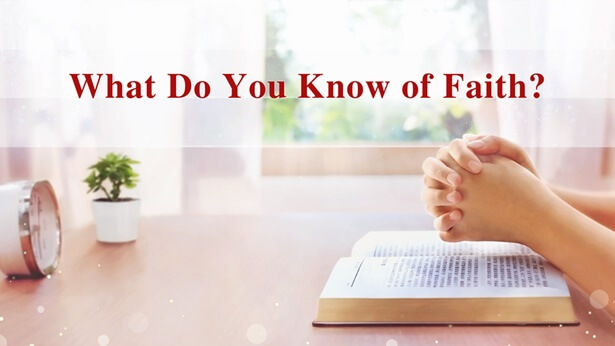 When you find the real answer, then you will admit that you are not a believer of God, but rather one who deceives, blasphemes, and betrays Him, and one disloyal to Him. Then you will realize that Christ is no man, but God. When that day comes, then you will revere, fear, and truly love Christ. Presently, your faith is only thirty percent of your heart, while seventy percent is possessed by doubt. Any deed done and any sentence spoken by Christ can cause you to form notions and opinions about Him. These notions and these opinions stem from your complete unbelief in Him. You admire and fear only the unseen God in heaven and have no regard for the living Christ on earth. Is this not also your unbelief? You yearn only for the God who did work in the past but do not face up to the Christ of today. These are always the “faith” mingled in your hearts that does not believe in the Christ of today. I do not underestimate you, for there is too much unbelief within you, too much of you that is impure and must be dissected. These impurities are a sign that you have no faith at all; they are a mark of your renouncement of Christ and brand you as a betrayer of Christ. They are a veil covering your knowledge of Christ, a barrier to your being gained by Christ, an obstacle preventing your being compatible with Christ, and a proof that Christ does not approve of you. Now is the time to examine all parts of your life! Doing so will profit you in every way imaginable!